Amy Lara Constable nee Jackman – THE TRUST THAT LET ITS PATIENTS DIE! You were employed at Galleywood Ward (‘the Ward’), The Linden Centre, North Essex Partnership NHS Foundation Trust (the Trust) as a Band 6 Registered Mental Health Nurse. The Unit is an acute in-patient ward for people requiring support with their mental health. The referral related to an incident which took place on 15 November 2012. It was alleged you had signed a backdated care plan which had been drafted by a colleague, and that when you signed it you knew that the patient whose care plan it was, was already dead. The panel has decided that a caution order would adequately protect the public. Nursing and Midwifery Council: Represented by Douglas Lloyd, counsel, instructed by NMC Regulatory Legal Team. informed Dr 5 that an agency nurse had been involved in the referral and/or not understood, when this was not true. Complete the Discharge Checklist for Patient C.
Contact and/or record your attempts to contact the Next of Kin to inform them that Patient C was being discharged on that day. And, in light of the above, your fitness to practise is impaired by reason of your misconduct. The panel heard an application by Mr Lloyd, on behalf of the NMC, to amend the wording of charge 3. Mr Lloyd stated that charge 3 currently reads ‘On 21 October 2011…’. His application was to amend the date to read ‘In October 2011…’ He submitted that the proposed amendment would accurately reflect the evidence and would not cause injustice. Mr Short did not oppose the application. unless, having regard to the merits of the case and the fairness of the proceedings, the required amendment cannot be made without injustice. The panel was of the view that the application was in the interests of justice. There would be no prejudice to yourself and no injustice would be done to either party. It was appropriate to allow the amendment and the application was granted. The NMC received a referral from your employer on 23 August 2013. The circumstances were as follows: shortly after mid-day on the day in question Patient E was found in his room hanging from a self-made ligature. He had committed suicide. Patient E had been on the ward for seven days. An initial care plan was in place but this should have been replaced with a comprehensive care plan 72 hours after admission. You were not Patient E’s allocated nurse, but you were nonetheless asked by your senior manager to sign the backdated care plan shortly after his death. 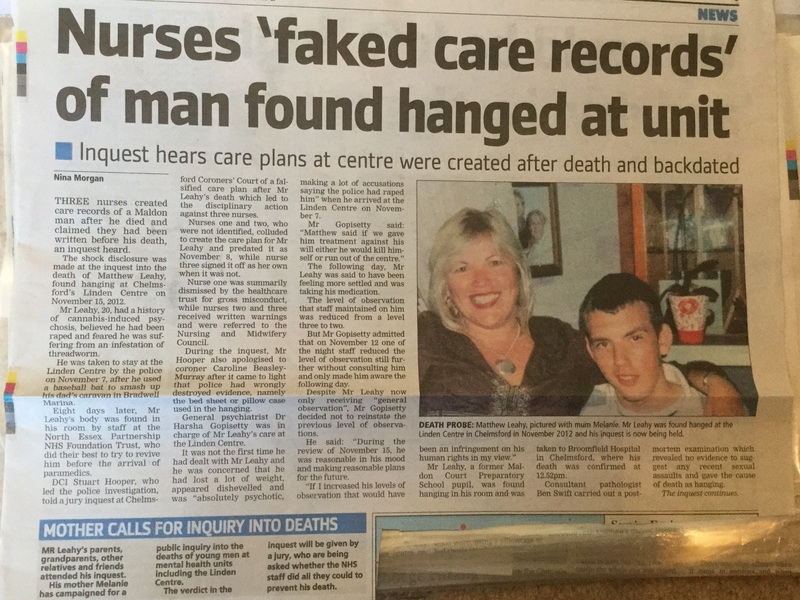 You did not know, and it is not suggested that you knew, that the care plan had been drafted after Patient E’s death. Your conduct came to light on 2 January 2013 when you approached an Investigations Assistant and informed her that you had been asked to sign the care plan by a senior manager. The senior manager was also a registered nurse who was your line manager. You had complied with the request, however on receiving further information about what your had signed you had realised this had been a breach of proper professional conduct and that it had serious implications. Following an enquiry conducted by an external investigator and a disciplinary hearing, you were given a 12 month written warning. As a result of you being referred to the NMC, routine enquires were undertaken on its behalf, as a result of which a number of other allegations came to light. Which a number of allegations came to light which are reflected in the chart sheet. In reaching its decisions on the facts, the panel considered all the evidence together with the submissions made by Mr Lloyd, on behalf of the NMC and those made by Mr Short, on your behalf. The panel heard and accepted the advice of the legal assessor. The panel was aware that the burden of proof rests on the NMC, and that the standard of proof is the civil standard, namely the balance of probabilities. This means that facts will be proved if the panel was satisfied that it was more likely than not that the matters occurred as alleged. In reaching its decisions on the facts the panel took into account all the oral and documentary evidence in this case. Dr 5, Consultant Psychiatrist at the Trust. Mr 8, Older Adult Services Registered Nurse, Alexandrea Hospital. The panel also heard evidence from you under oath. Mr 8 to be honest and clear. In relation to your evidence the panel observed that there had been a significant passage of time since these incidents. Furthermore, save for charge 5 you were given no indication after the incidents concerned that these matters were anything other than closed. The panel accepted that it would be difficult for you to remember the events (except those that relate to charge 5) given this passage of time and that the Trust regarded these matters as having been dealt with. The panel is of the view that you could not reasonably be expected to have an accurate recollection given these factors. The panel is satisfied that you have not lied or tried to deliberately mislead it but that through the passage of time you have reflected on these charges and have come to a version that supports your view. At the start of this hearing you admitted Charge 5. The panel found this charge proved. The panel considered each charge and made the following findings. This charge is found proved. Dr 5’s evidence was that around 3.30pm on 20 October 2011 she approached you to ask you if Patient E had been formally detained under Section 3 of the Mental Health Act. She told the panel that you replied that Patient E had not yet been detained. You told the panel that you had, indeed, told Dr 5 that Patient E had not yet been detained. You speculated as to the possibility that perhaps this was because the Crisis Team could not find a second doctor to certify in accordance with the requirements under the Act. You told the panel that you subsequently made a telephone call to the Crisis Team, to whom the referral should have been directed, and that they told you they had not received it. You told the panel that this is what you told Dr 5. You also denied having told Dr 5 that the Crisis Team had said that they were sorry. In light of your evidence and that of Dr 5 the panel was satisfied that you had told Dr 5 that the reason that Patient E’s detention had not been certified was because the matter had not been referred to the Crisis Team by the nursing staff, however, the panel was not satisfied that the sequence of events was as described by Dr 5. The panel was satisfied, on a balance of probabilities, that having made a telephone call to the crisis team you told Dr 5 why it was that Patient E had not been formally detained. To this extent, but to this extent only, charge 1.1 is found proved. This charge is found not proved. The panel considered, firstly, whether you told Dr 5 that the Crisis Team had mislaid the referral and secondly, whether you told her they had said ‘they are sorry’. In relation to the first issue, the panel heard evidence from Dr 5 that it was she, herself, who had suggested to you that the Crisis Team may have mislaid the referral. This account was the same as that given by Dr 5 in a letter, dated 2 November 2011, to Mr 9, Clinical Manager / Matron. This account of events was confirmed in your oral evidence. You told the panel that you did not tell Dr 5 that the crisis team may have mislaid the referral. The panel determined that it was Dr 5 who suggested to you that the Crisis Team may have mislaid the referral. In relation to this part of the charge, the panel found charge 1.2 not proved. You told the panel you had, indeed, apologised to Dr 5 but that this had been on your team’s behalf and that you did not tell her the crisis team had apologised. The panel determined that Dr 5 could have been mistaken regarding this sequence of events and the words used. There were inconsistencies between Dr 5’s letter written shortly after the incident, her witness statement and her oral evidence. This incident took place over three years ago. The panel could not be satisfied, on the balance of probabilities that Dr 5 was not confused regarding the sequence of events and the words used. The panel found charge 1.2 not proved. Again there were two conflicting accounts of this incident. The panel heard evidence from Dr 5 that following your telephone call with the Crisis Team had told her ‘perhaps they [the crisis team] could not find a doctor’ and ‘also it doesn’t help that an agency nurse phoned it through and they didn’t really understand her’. The panel accepted your evidence that you were speculating at this point as you knew that Patient E had not been detained but did not know that a referral had not yet been made to the Crisis Team. The panel accepted that you were not trying to mislead Dr 5 and was merely offering a possible reason as to why the formality of Patient E’s detention had not been completed. You told the panel that following your telephone call to the Crisis Team, you told Dr 5 that you had handed the referral to an experienced bank nurse and that she had failed to make the referral to the Crisis Team. The panel determined that you did say ‘perhaps they [the crisis team] could not find a doctor’ but it cannot be satisfied that this was at the time or in the context alleged by the NMC. The panel further determined that you did not say ‘it doesn’t help that an agency nurse phoned it through and they didn’t really understand her’. The reasons for the panel’s determination are the same as those in charge 1.2 above, namely that the panel concluded that Dr 5 could have been mistaken. The panel found this charge not proved. The panel has made findings above regarding charges 1.1, 1.2 and 1.3. This charge, Charge 2, and its component parts are reliant for their proof upon the panel being satisfied that you used the words alleged in charge 1 in the context and in the sequence alleged, such that they could be said to establish that you acted dishonestly in that you attempted to deliberately mislead Dr 5. The panel has found charges 1.2 and 1.3 not proved. Charge 1.1, which the panel has found proved, does not support an allegation of dishonest conduct. It was in effect, an accurate reflection of the truth. In the circumstances charge 2 and charges 2.1 to 2.4 are found not proved. The panel heard evidence from Dr 5 that she entered the room and saw you and Patient A. She told the panel that she was behind you and that you had not heard or seen her enter the room. She told the panel that she heard you shout at Patient A ‘stop going on and on, I’m not bloody deaf’. Dr 5 told the panel that you then saw her and you stopped shouting, and that you and she then walked into the office together. Dr 5 told the panel that she told you to calm down. She indicated that it appeared to her that you lost control of yourself. Following this incident, Dr 5 made a note of what she had seen and heard, and based on this note, she subsequently wrote to Mr 9, 2 November 2011, giving her recollection of events. Your evidence differed from Dr 5. You told the panel that Patient A was a very difficult patient, that she had been screaming at you prior to Dr 5 entering room and that you were using a de-escalation technique. You told the panel that Dr 5 misread the situation. You denied using the word ’bloody’ but admitted to telling the patient to ‘stop going on’. You stated that you would have raised your voice in line with de-escalation policy to calm Patient A but that you did not scream or lose control as suggested by Dr 5. Dr 5 candidly admitted that she had no knowledge of the events which preceded the shouting or any knowledge of Patient A. The panel was of the view that whilst Dr 5 may have been inconsistent in her descriptive summary of your actions, in particular whether you ‘shouted’ or ‘screamed’, she was consistent in regard to the words used. The panel preferred Dr 5’s evidence to yours regarding the words you used and was satisfied that you shouted at Patient A. The panel concluded that in relation to the words used you did say to Patient A ‘stop going on and on, I’m not bloody deaf’. To this extent the panel found charge 3 proved, however it cannot be satisfied, in light of all the evidence, that your shouting was not justified or that you had lost control. In reaching this decision the panel noted that there were two conflicting accounts of this incident. The panel heard evidence from Mrs 3 that she was behind you but to one side when she heard you make this comment. She told the panel that you and other colleagues were helping Patient B who was on the floor. Mrs 3 in her evidence stated that you said to your colleagues that ‘If I ever get like that, I want to go to Switzerland’. Mrs 3 stated, however, that it was her opinion that Patient B would not have heard this comment. Mrs 3 stated she indicated to you that your comment was not acceptable and you acknowledge that. Mrs 3 prepared a contemporaneous note of the incident but did not take the matter further or discuss it further with you. You told the panel that you had made the comment, but that it was in the staff room in a discussion between colleagues and not in the presence of Patient B. You denied that the comment was made in relation to Patient B stating that it was in your own beliefs. Mrs 3’s note confirmed her oral evidence. Mrs 3 did not think that Patient B could have heard your comment but it was made whilst he was still being attended by staff and it was not made subsequently in the staff room. The panel concluded that in the circumstances your comment was inappropriate and unprofessional. The panel found charge 4 proved. The panel heard evidence from Mrs 4 that a discharge checklist existed and it was a tool to be used by nursing staff when discharging patients. Mrs 4 told the panel that it was circulated to nursing staff prior to the incident on 27 May 2013. Mrs 4 told the panel that the checklist would have been in each patient’s admission folder. Your evidence differed from that of Mrs 4, in that you told the panel that the discharge checklist was not in circulation prior to this incident. You told the panel that you assembled the patients’ admission folders and knew what they contained. You said that at the time of the incident the discharge checklist was not in use. The panel heard evidence from Mrs 6 who was a staff nurse on the ward at the time of this incident. She told the panel that discharge checklist did not come into use until around June 2014. The panel preferred your evidence and the evidence of Mrs 6, to that of Mrs 4. The Trust’s policy stated that the Next of Kin should be contacted when a patient was discharged and you accepted that this was so. However, you said it was Patient C’s express wish that his family should not be contacted. You said that in light of Patient C’s request for confidentiality you were neither obligated nor permitted to make contact with his next of kin. On a balance of probabilities, the panel could not be satisfied that your actions were not subject to obligations of confidentiality and thus that you were under an obligation to contact Patient C’s next of kin. The panel found charge 6.2 not proved. The panel heard evidence from Mrs 4 that during a supervision meeting on 22 January 2014 you and she discussed the circumstances surrounding C’s death and the subsequent Coroner’s inquest. She told the panel that you had made the comment ‘he was just a drunk anyway’ and she had told you that Patient C was still someone’s son or sibling and that your comment was inappropriate. You told the panel that you made no such comment and that Mrs 4 was mistaken. The panel preferred the evidence of Mrs 4. She was clear in her recollection and was able to describe not only what you said but her reaction to it. The panel found charge 7 proved. Having announced its finding on all the facts, the panel then moved on to consider firstly whether the facts found proved amount to misconduct and, if so, secondly whether your fitness to practise is currently impaired. The NMC has defined fitness to practise as a registrant’s suitability to remain on the register unrestricted. The panel took into account the submissions made by Mr Lloyd on behalf of the NMC and by Mr Short on your behalf. The panel has accepted the advice of the legal assessor. The panel adopted a two stage process in its consideration as advised. First, the panel must determine whether the facts found proved amount to misconduct. When determining whether the facts found proved amount to misconduct the panel had regard to the terms of the code: Standards of conduct, performance and ethics for nurses and midwives in force at that time, namely the May 2008 edition. The panel in reaching its decision accepted that there was no burden or standard of proof at this stage and exercised its own professional judgement. In relation to charge 1.1, the panel is of the view that your actions were not misconduct. As the panel found, charge 1.1 is simply a statement of fact. You did tell Dr 5 that nursing staff had failed to arrange for Patient E’s detention. The panel was of the view that this was simply a true statement which attracts no criticism. 1 You must treat people as individuals and respect their dignity. 44 You must not tamper with original records in any way. 61 You must uphold the reputation of your profession at all times. The panel appreciated that breaches of the code do not automatically result in a finding of misconduct. In relation to charges 3, 4 and 7, the panel notes that the comments and language were unprofessional and inappropriate; you were a senior nurse, and some of the comments were made in the presence of patients and junior staff. On the other hand, the panel also noted that there was no evidence of patient harm, the incidents were aberrations from your normal working practice, and they were dealt with at the time and were not seen as so serious that they required formal disciplinary action. In relation to charge 5, the events which preceded your signing of the care plan were traumatic and place you under great stress. Your actions were a mistake which you corrected in due course. The panel was, however, of the view that despite the clear mitigation in this case, your act of signing of a back dated care plan without checking what you were signing, and would have a serious impact public confidence in the integrity of medical records and the nursing profession. Accordingly, the panel determined that charges 3, 4, 5 and 7, taken collectively, were actions that did fall significantly short of the conduct and standards expected of a nurse and amounted to misconduct. The panel next went on to decide if as a result of this misconduct your fitness to practise is currently impaired. Nurses occupy a position of privilege and trust in society and are expected at all times to be professional. They must make sure that their conduct at all times justifies both their patients’ and the public’s trust in the profession. In determining whether a practitioner’s fitness to practise is impaired by reason of misconduct, the relevant panel should generally consider not only whether the practitioner continues to present a risk to members of the public in his or her current role, but also whether the need to uphold proper professional standards and public confidence in the profession would be undermined if a finding of impairment were not made in the particular circumstances. I would also add the following observations in this case having heard submissions, principally from Ms McDonald, as to the helpful and comprehensive approach to determining this issue formulated by Dame Janet Smith in her Fifth Report from Shipman, referred to above. At paragraph 25.67 she identified the following as an appropriate test for panels considering impairment of a doctor’s fitness to practise, but in my view the test would be equally applicable to other practitioners governed by different regulatory schemes. The panel accepted that you have demonstrated significant insight in relation to charge 5. You admitted your actions in relation to this charge not only to this panel but to your employer. Indeed when you discovered the true nature of the document you had inappropriately signed you reported the matter, albeit after some delay. You told that panel that you should not have signed the care plan and accepted that your actions were wrong and were willing to accept the consequences. The panel heard from witnesses called on your behalf that you are a professional nurse and that your actions set out in all the charges were out of character. Mr 8 told the panel that he would not have any concerns with you caring for any members of his family. Ms 7 told the panel that if you were to make a mistake, it would worry you, and you would own up to it. The panel also heard from the NMC witnesses called to give evidence against you, including your supervisors at the time of the incidents that you were a good nurse and they were aware of no similar incidents. The panel noted from your oral evidence at this hearing, that you demonstrated genuine remorse and regret as to your conduct. The panel was of the view that you have learnt from your misconduct and that the risk of repetition of any similar misconduct is very low. However, the integrity of medical records is an issue of the highest importance and your failure to maintain that integrity as reflected in the panels finding in relation to charge 5 is a particularly serious issue. With regard to that matter the panel is of the view that despite its confidence that the risk of repetition is very low, a finding that there is no current impairment would fail to declare and uphold proper standards and would fail to maintain public confidence in the profession and the NMC as regulator. Accordingly the panel has determined that your fitness to practise is currently impaired.